Outside of the Leif Erikson boat itself, Leif Erikson Park is best known for its Rose Garden, first planted by F. Rodney Paine in 1930. In his annual report, Paine wrote that “The beds in upper Leif Erikson Park which had previously been planted every spring to annual bedding plants were planted this year to hybrid tea and hybrid perpetual roses. Some of these plants were furnished from the municipal nursery and the balance were furnished by the Duluth Garden Flower Society. It is the intention of this group to be responsible for these rose beds in that they will replace any plants that may die from time to time.” Over the years the garden fell into neglect, was resurrected by volunteers, then removed for highway development and finally reinstalled and improved. One of the most popular features of Duluth’s entire park system, today the Rose Garden features a marble gazebo with a wrought-iron dome, stone benches, and two monuments: a fountain in memory of a Duluth pioneer and a statue of the park’s namesake. One of the garden’s most prominent features is the Stone memorial fountain, built to commemorate Duluth pioneer George C. Stone. In 1869 Stone and George Sargent came to Duluth as agents of Jay Cooke and set up Duluth’s first bank. Stone was credited for actually running the business and was described as “a peculiar-looking man… [who] was not very well dressed, talked smoothly, seemed to have had considerable experience of the world, and transacted all the business.” When Duluth became a city in 1870, he was appointed as its first treasurer and helped found the first Duluth Chamber of Commerce; he also promoted iron mining on the Vermilion Range and later helped the Merritt family open the Mesabi Iron Range. The fountain, designed by St. Paul architect Thomas Holyoke and financed by Stone’s daughter, Clara Stone Blood, was erected in October 1905 on a small triangular plot between Ninth and Tenth avenues east at the junction of Superior Street and London Road. Made of granite quarried at Ortonville, Minnesota, the fountain included a bronze electric lantern for illumination. It was used to water horses and even had access for dogs to get a drink, but when Duluth’s ice delivery men started using its water to rinse debris from ice, the public protested. 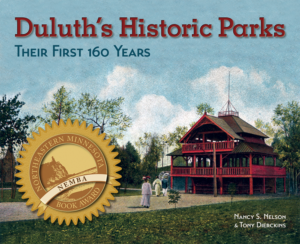 In 1927 it was moved to the eastern edge of Lake Shore Park, adjacent to the Duluth Curling Club, perhaps because it was no longer needed on the street since automobiles had replaced horse-drawn carriages. The western edge of the Rose Garden is marked by another monument, a bronze statue of Leif Erikson, which was erected in 1956 and contributed to the city by the now-defunct Norwegian American League of Duluth, a conglomerate of a dozen church and civic organizations with strong ties to Norway. Individuals also donated by subscription. The statue depicts Erikson holding a ship’s rudder in his right hand while his left hand appears to be shielding his eyes, though it has been suggested that his hand is “positioned to hold a solar navigator.” A crucifix hangs from a chain around his neck, referencing his conversion to Christianity. The polished-granite base on which the statue stands includes the legend “Leif Erikson Discoverer of America 1000 A.D.” City Council proceedings following the statue’s installation state that, “part of the land upon which now stands the Leif Erikson Statue, the land formerly known as Lake Shore Park, be now named, and shall thereafter be known as Leif Erikson Park.” Apparently in 1956 no city officials were aware that the park had already been christened Leif Erikson Park in a grand ceremony held in 1929. The statue was sculpted by Norwegian immigrant John Karl Daniels, and it wasn’t Daniels’ first depiction of Erikson. 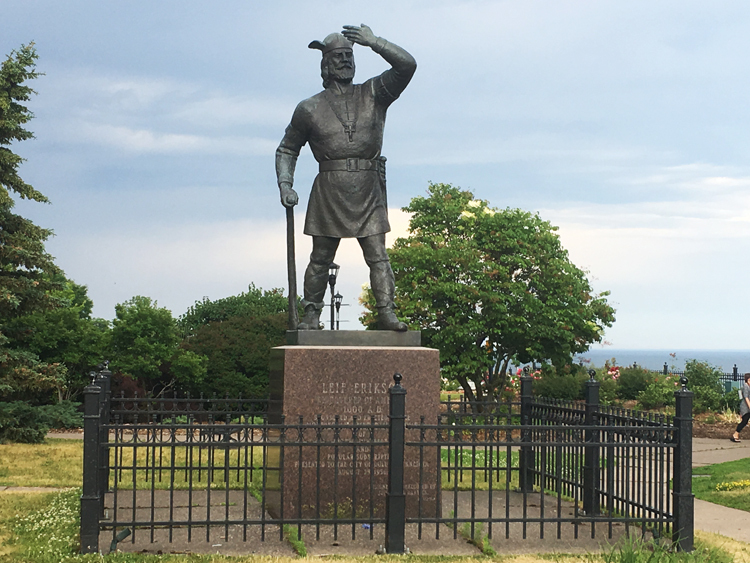 In 1949 his thirteen-foot-tall bronze statue of the Norseman was installed next to Minnesota’s state capitol building; its plaque also reads “Leif Erikson Discoverer of America 1000 A.D.” That statue—dedicated on October 9, 1949, aka “Leif Erikson Day” in Minnesota—was sponsored by the Minnesota Leif Erikson Monument Association and paid for by popular subscription. The monument association was organized in 1931, the same year a statue of Christopher Columbus was raised on the capitol grounds. At the time, there was a rivalry between Norwegians and Italians over which man first “discovered” America. Daniels’ depictions of Erikson in Duluth and St. Paul are noted for the wings sprouting from the explorer’s helmet, making him look like a mythological Greek or Roman god rather than an actual Norse adventurer. History experts agree that no Viking ever wore a helmet adorned with wings or horns or any other animal parts; that idea is a product of twentieth-century imagination, reinforced by popular culture. Statues of Erikson stand in eight U.S. cities and in Iceland, Greenland, and Norway. Only those sculpted by Daniels show the Norse explorer wearing a winged helmet. In 1967 a new rose garden bloomed at Leif Erikson Park when Ronald Thomas and Ausma Klints formed the Duluth Rose Society and created what was then the second largest rose garden in Minnesota. With $5,000 in donations, Klintz designed a garden 620 feet long, stretching from the Erikson statue to the Curling Club parking lot. She called her design “European” for its use of concentric circles (others called it “English”) and placed the Stone fountain at the center of the largest circular bed. The society planted more than two thousand bushes of over seventy varieties of roses. In the late 1980s, Leif Erikson Park’s Rose Garden was temporarily removed during the expansion of Interstate 35 through eastern Duluth, then rebuilt in 1994 using a design reflective of Klintz’s original layout. Today the English-style garden contains more than three thousand rose bushes of at least one hundred varieties as well as more than twelve thousand other plantings.